Homemade ice cream is a great summer treat. 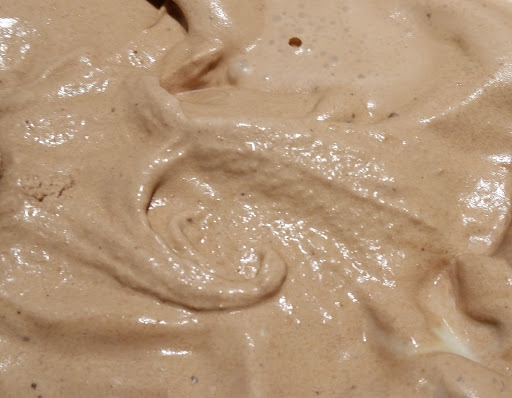 No commercial ice cream beats the flavor of what you can easily make at home. Having several flavors on hand makes a ready and delicious dessert any time you have friends over for dinner. I have a six quart White Mountain electric ice cream freezer. To me, this is the gold standard ice cream maker for home use: simple, well-made, and easy to use and clean. The only issue is that you have six quarts of one kind of ice cream, or you need to make several smaller batches and clean the unit each time if you want different flavors. I know from experience that you cannot maintain a healthy weight and have multiple six quart tubs of ice cream in the freezer at one time. 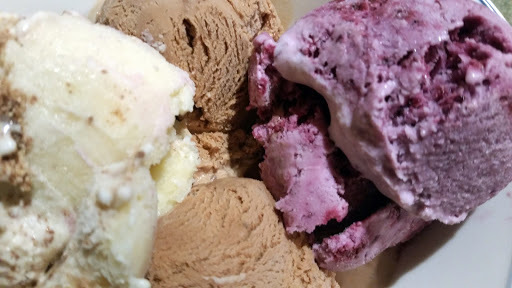 I set out to figure out how to make several kinds of ice cream from one batch. Today, I made 10 quarts of ice cream, 4 flavors, from one batch. Here’s how. Start by making a large batch of ice cream base. Beat the eggs with half of the sugar. Heat the milk and cream with the remaining sugar. I usually shoot for 150F. Slowly whisk 4-5 cups of this hot mixture into the eggs to temper them (you do not want sweet scrambled eggs). Then slowly add the egg mixture to the pot with the rest of the milk and cream. Cook, stirring constantly until the mixture coats a spoon. This is usually about 170F. Add the vanilla. Most recipes will tell you to strain the mixture, but I do not do that. Who cares if there are a few custardy lumps in the ice cream? Refrigerate this mixture over night. It should be about six quarts. 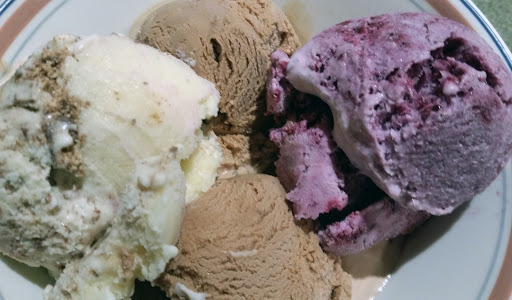 The flavors of ice cream I made this time were raspberry, chocolate, Heath Bar crunch, and chocolate cherry. I had to make some flavorings for chocolate and raspberry. 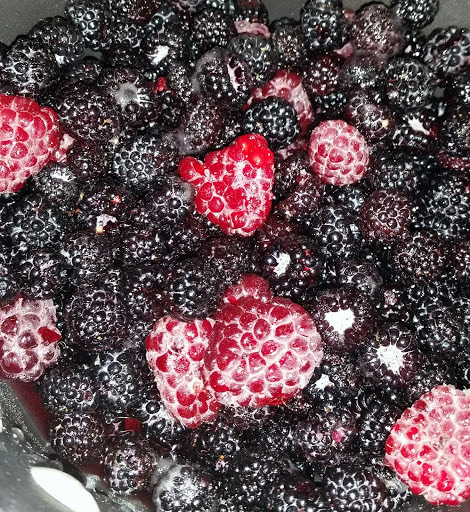 For the raspberry, I washed a quart of garden fresh berries and let them drain. It was a mixture of black, purple, and red raspberries. I put them in a small sauce pan with ¼ cup of cool water and ½ cup sugar. While stirring, bring this to a boil and cook until the berries break down. Press them through a fine mesh sieve to remove the seeds, but then I took 2-3 T of the berry pulp from the sieve and added it to the strained berries. This will add a little more texture to the finished ice cream. Macerating raspberries. Look at those purple raspberries; they’re bigger than quarters! For the chocolate, I used about 300 grams of Callebaut dark Belgian chocolate. I chopped it up fine with a knife. Put the chopped chocolate in a sauce pan and add about 2 cups of milk. Stir and heat until the chocolate melts and the mixture is smooth. Add more milk if needed. You want to be able to chill this overnight and not have it be solid. The next day, I set up the trusty White Mountain freezer. I added about 4 quarts of the chilled ice cream base and run the machine per instructions for about 20-25 minutes. While it’s running, prepare two chilled stainless steel bowls. One with the raspberry puree and the other with a cup of crumbled Heath bars. Unplug the ice cream freezer, and remove the ice cream canister. Add some of the ice cream to each bowl; enough to make two quarts of each. Mix them up and put into the containers you will use in the freezer. I am a huge fan of Cambro containers, so I used two 2-quart rectangular Cambro containers. 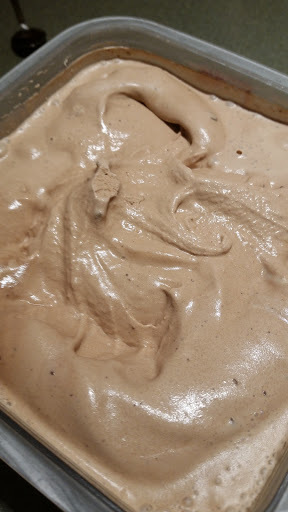 I then topped up the ice cream canister with the remaining base mix, and added the chocolate/milk mixture I had prepared the night before. Put it back in the White Mountain freezer, and top up the ice and salt as needed. Run for another 20 minutes. Then I took four quarts of the frozen chocolate ice cream and put it into a 4-quart rectangular Cambro, and emptied the rest into a chilled stainless steel bowl with a cup of dried sour cherries. I mixed that up, and scooped it into another 2-quart rectangular Cambro container. There you have it. Ten quarts of homemade ice cream in four flavors made from one batch of base.